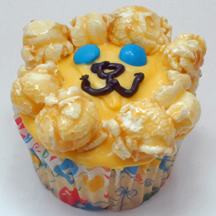 All you need to top this easy lion cupcake is caramel corn, mini M&Ms and a tube of black writing or gel icing. These would be great for a jungle party or other kid event. What You Need: 1 cupcake; frosting tinted deep yellow; caramel popcorn; 2 blue mini M&Ms; black writing icing or gel icing in a tube. How to Make It: Frost cupcake. (You should do the eyes, nose and mouth first so you don’t have to reach around the mane). Place 2 blue mini M&Ms, writing side down, for eyes. Use tube icing to draw nose and mouth (muzzle). Add caramel corn in a circle around the cupcake for mane. This entry was posted on Monday, July 28th, 2008 at 5:08 pm	and is filed under animal cupcakes. You can follow any responses to this entry through the RSS 2.0 feed. Responses are currently closed, but you can trackback from your own site.